Cats are fantastic pets to have and many cats are indoor cats, which means that they will be using a litter box inside your home. The litter box is, of course, the normal method to go with here. Yet, litter boxes do have their own problems, mainly the smell which they create. You probably clean the litter box on a regular basis, but putting that waste in your normal garbage is not really the best option either. This is where the Litter Genie Ultimate Cat Litter Disposal System comes into play – a safe, effective, and smell free way to get rid of cat waste in your home. When it comes down to it, the Litter Genie Ultimate Cat Litter Disposal System is more or less just a highly specialized and well-built disposal and holding system for cat waste. This is a plastic container with an airtight lid that holds the smells inside. It doesn’t require any assembly at all. Moreover, it is made with special microbial technology to eliminate cat waste odors, kills germs, and keep your house from smelling like cat waste. When all is said and done, although a very simple thing, it works wonders to contain those rancid smells. Simply put, if you have a cat, then the Litter Genie Ultimate Cat Litter Disposal System is probably ideal for you. Ok, so if you have an outdoor cat that does its business outside instead of in a litter box, the Litter Genie Ultimate Cat Litter Disposal System might not be ideal for you, as you simply don’t need it. However, many cats are strictly indoor house cats, which means that they do their business in a litter box. That litter and waste needs to be cleaned often and put in the garbage, but trash bins don’t do a good job at containing smells and germs, which is where the Litter Genie Ultimate Cat Litter Disposal System comes into play. When you buy the Litter Genie Ultimate Cat Litter Disposal System, you get a fairly large cat litter disposal bin. It’s a simple but effective plastic bin, one which is airtight and keeps the smells inside. Here you also get a scoop so you can easily empty your cat litter into it. It even comes with special 7-layer bags with anti-microbial and smell-killing properties to effectively contain and kill germs and odors. The anti-microbial bags and properties here are meant to last up to 3 weeks, which is 30% longer than most other options. Other than that, all you need to get going here is a cat! AS EASY AS 1-2-3 - From the makers of Diaper Genie, our nose-friendly, life-improving cat litter disposal system works in just three steps. Scoop the pet waste, open the lid and drop the clumps, and pull the handle to lock it in. HASSLE-FREE ODOR CONTROL - With antimicrobial to inhibit odors caused by bacteria on the pail, and a refill that lasts 10 weeks for one cat (thats 30% longer than our standard refill), the Litter Genie Plus pail locks away germs and odors to keep your house smelling fresh. JACKSON GALAXY APPROVED - As a cat behaviorist for over 20 years, Jackson Galaxy, the official Cat Daddy, understands what it takes to create a happy home for cats and the people who love them. 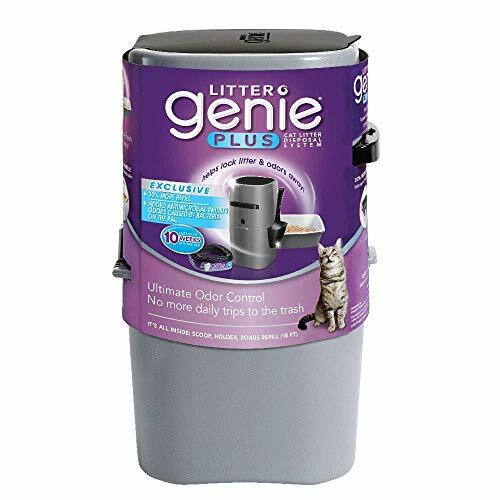 Litter Genie is a necessity (not a luxury) in his home and thats why he recommends this cat litter disposal system to all cat owners across America. KISS TRASH TRIPS GOODBYE - The pail holds up to 14 days of cat litter (for one cat) so you can spend more time playing with your kitty and less time making daily trash trips. A PURRFECT FIT - The compact design makes Litter Genie perfect for small spaces and homes with multiple litter boxes. Discreetly store your pail in a cabinet or small space near your cats litter box for quick, hassle-free clean up. In terms of the features of the Litter Genie Ultimate Cat Litter Disposal System, there really is not that much to talk about. It’s a plastic bin, one that is easy to clean, which is already quite a bonus. It comes with an easy-to-open lid and a scoop so you can drop the cat waste in the top. The lid closes, then underneath it there is a pull lid which operates from the outside. Pull this slide lid out do cause the cat waste to drop into the bag below. The Litter Genie Ultimate Cat Litter Disposal System features special 7-layer bags with anti-microbial properties. These bags are thick, they are almost impossible to rip, and they work wonders to eliminate and contain germs and odors cause by cat waste. There are also special anti-microbial and anti-smell bins that go in the bottom, which help control odors and germs even more. Other than that, there is really not too much to say about the Litter Genie Ultimate Cat Litter Disposal System. The Litter Genie Ultimate Cat Litter Disposal System is not very hard to use. It’s a simple disposal system. First of all, it comes with an airtight light. Simply pour the waste into the top of this item. Afterwards, there is a handle located just below the top, one which you need to pull. This will drop the waste into the compartment below, the compartment which holds the 7-layer bags. It’s a good double door system that works well to contain those odors. When the bag is full, simply dispose of it and put new bags in. When you notice smells getting bad, replace the odor killer. It really does not get much easier than that. If for whatever reason you do not like the Litter Genie Ultimate Cat Litter Disposal System, there are other options to go with. Another option you can take a look at is the Catit Hooded Cat Litter Pan Kit. This is actually a hooded cat litter cover which is actually meant to house cat litter boxes inside of it. We suppose you could say that this is actually a good addition to the disposal system, as opposed to an alternative. The Catit Kit is designed to keep the litter box out of sight and out of mind. It helps to contain messes, smells, and it helps your home look a little nicer too. The Litter Genie Ultimate Cat Litter Disposal System is definitely a very convenient thing to have in your home if you have a cat. The fact is that cat waste, and the litter it sits in, is full of germs, and it smells terrible. You really don’t want to be putting that stuff in the trash bin under your sink, because the whole house will smell. The Litter Genie Ultimate Cat Litter Disposal System does away with that stink; it can hold up to 2 weeks of cat litter and waste, and it keeps your home from smelling like your cat’s dinner from the night before.